Last updated: 01.00 12th May 2003 - See Site Update Information. Welcome to the Round the World 2003 Flight by John Consterdine. This trip takes place using Microsoft Flight Simulator 2002. 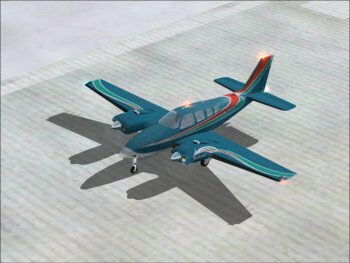 Only one aircraft will be flown throughout the journey, which will be a modified* version of the default Beechcraft Baron 58. The flight has begun and you can see the first reports and screenshots by following the "Part 1" link. 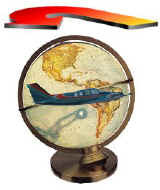 My objective is to circumnavigate the Earth, exploring all 5 continents, and seeing what there is to see. This is my second attempt at this, the first one prematurely terminating in an airfield in Venezuela. I was then without a P.C. for some time. Now that I've built the one I'm typing on, I've decided to give it another go. I hope you enjoy the reports and pictures I'll be filing of each stage of the journey. There are now two ways of viewing these. Either click the link for the part of the journey you're interested in (e.g. Part 1) and select the leg from the links, or go to the Interactive Route Map and click on the legs displayed there. * Follow the Hardware and Software link for more details. Bookmark this page to be notified about updates. 01.00 12th May 2003 RTW2003 on hold: Due to the imminent loss of my internet connection I will be unable to continue publishing the progress of the flight for the foreseeable future. I shall continue the flight off-line and as and when I'm in a position to restore my internet connection, I'll publish the remainder. I'd like to extend my heartfelt thanks to all of you who have taken an interest in this, and I wish you all well for your personal futures. 19.38 6th May 2003 Leg 13 published. 22.00 29th April 2003 YPPH Perth, Australia added to the pre-booked destination list in the flight log. Interactive map format changed to improve route visibility and halt colour degradation. 01.15 29th April 2003 Hardware and Software page updated with new screensaver software details. Panel Image updated on this page to reflect the one currently in use. Note that this version has been updated since my last release of this panel and some gauges are new and may appear differently. Site Update Information Archive page set up - In order to reduce page loading time, I've set up an archive of old update information. The link is available at the bottom of the list. 02.15 27th April 2003 Leg 12 published. Slightly less eventful, thankfully! Pre-booked destinations yet to be flown to, added to the map. 22.10 24th April 2003 Leg 11 published. The fact there will be a leg 12 after this is a minor miracle! 14.30 21st April 2003 Additional link added to the Hardware and Software Aircraft section to download my panel. 03.00 16th April 2003 Two more pre-booked destinations added to the Flight Log page. Some problems with missing screenshot titles and site navigation links fixed. 04.25 11th April 2003 Two more pre-booked destinations added to the Flight Log page. 00.20 11th April 2003 Tenth leg published - longest yet!! Another pre-booked destination added to the Flight Log page. This website is best viewed in a resolution of 1024 X 768 or greater. Internet Explorer recommended.